ECEFast presents a new range of thermocouple SD card loggers by Lutron designed to deliver high data logging convenience. The new series of data loggers and handheld logging instruments with data saved to an SD card released by Lutron also includes the Lutron MTM380SD, a 3-channel type K thermocouple input device with large display of all three channels. 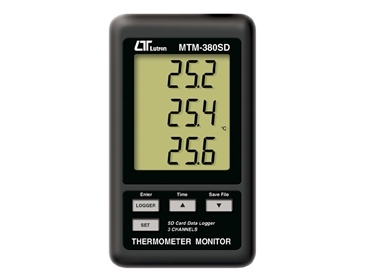 Lutron MTM380SD thermocouple loggers allow data to be easily transferred to a PC and analysed using a standard spreadsheet program by logging directly to an SD card, eliminating the need for cables or to learn new software. For users who prefer specific software, there is a PC software package and USB cable available for more conventional handling of the data. Lutron’s range of SD card loggers can also measure carbon dioxide (CO2), barometric pressure, relative humidity, temperature, light, UV and sound level, water and air quality as well as air velocity among others.